I’ll be at Hart House, University of Toronto this Wednesday night, with any luck, with my son. 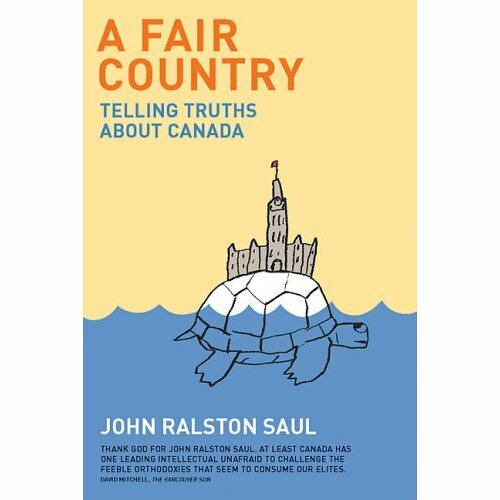 We’ll be listening to an essayist and philosopher called John Ralston Saul explain his newest book called A Fair Country: Telling Truth about Canada. We [Canadians] are a Métis civilization. What were are today has been inspired as much by four centuries of life with the indigenous civilizations as by four centuries of immigration. Perhaps more. Today we are the outcome of that experience. As have Métis people, Canadians in general have been heavily influenced and shaped by the First Nations. We still are. The influencing, this shaping is deep within us. When I dig around in the roots of how we imagine ourselves, how we govern, how we live together in communities – how we treat one another when we are not being stupid – what I find is deeply Aboriginal. Whatever our family tree may look like, our intuitions and common sense as a civilization are more Aboriginal than European or African or Asian, even though we have created elaborate theatrical screens of language, referrence and mythology to misrepresent ourselves to ourselves. I believe this is true in a very real sense. One thing that I am constantly amazed at is the truly unique Canadian rock-solid belief in egalitarianism. I think Saul is on to something here. Something more than just simply stirring the pot or posing. Canadians elected a bantam-sized former Baptist minister as the Greatest Canadian of all time in 2004. As a boy, Tommy Douglas needed surgery on his leg but his family could not afford it. It was only the charity of a surgeon that prevented him from having it amputated. Douglas never forgot and as Saskatchewan premier was responsible for the Canada’s first free hospital care. It doesn’t seem fair for people to have to chose between their health and their homes. Note that the book’s cover art speaks to an Ojibway/Anishinabe creation myth called Turtle Island. The Parliament of Canada, Centre Block, Ottawa, Ontario is borne on the turtle’s back. Turtle Island is a traditional name for North America. The name comes from a common indigenous creation story: The first human, a woman, tumbled from the sky to the earth below. At the time the earth was completely water. Birds caught the woman in their wings, but they needed land for her to live on. Several animals tried to dive to the bottom of the ocean to retrieve some dirt with which to build land. Finally, the muskrat succeeded. Placing the dirt on the turtle’s back, the woman blew and sent the dirt expanding across the ocean, making land for her to live on and a place for her to give birth to the first humans. This entry was posted on Monday, December 1st, 2008 at 4:13 pm and is filed under Writers. You can follow any responses to this entry through the RSS 2.0 feed. You can leave a response, or trackback from your own site. I always thought that the United States of America was a “fair” country and that the American people were treated as equals before the law –but I didn’t understand that the law could be used to “trick” good faith middle-class Americans looking for work and income into business investments that were known to be “high risk” and not profitable under cover of government regulatory policy. I am proud to be an American but not proud of the Federal Trade Commission or the Congress who have cooperated with the franchisors and the other special interests, the banks and lenders, the ABA, the Construction Corporations, the Mall Landlords, etc., to obscure the real and true risk of an investment in a retail franchise business opportunity from the new buyers of these francfhises. To my great disbelief, disappointment, and pain, I discovered that my government is silent and thus complicit when the law itself, together with process and procedure. is used to take unfair advantage of citizens who have invested in good faith in retail franchises that are often falsely represented as proven plans with little risk of failure. Egalitarianism appears NOT to be alive and well in the United States where so often the Corporate (person) captures the law that treats the weaker party unequally because of the big Corporate person’s claim to equal protection under the Bill of Rights. Hopefully, under the Obama regime, there will be hope for more honest regulation of the sale of franchises to the public, and more interest in keeping the corporations from buying law from the Congress that threatens and weakens the due process rights of individual Americans.